Easy-Kleen EZO4035G-K-GP-12 Review: Should You Buy Yay or Nay? This review looks at a high-end, premium pressure washer from the Easy-Kleen brand, which is suited for the biggest commercial tasks you can find. Usability is more complex than most other, smaller models, and this machine can take some getting used to as a result. Though expensive, this is one of the most feature-rich premium washers around. A medium score for usability, given the complexity of features. Once thing is for sure; you do get your money’s worth on quality. A powerful CU rating is backed up by hot water cleaning capability. 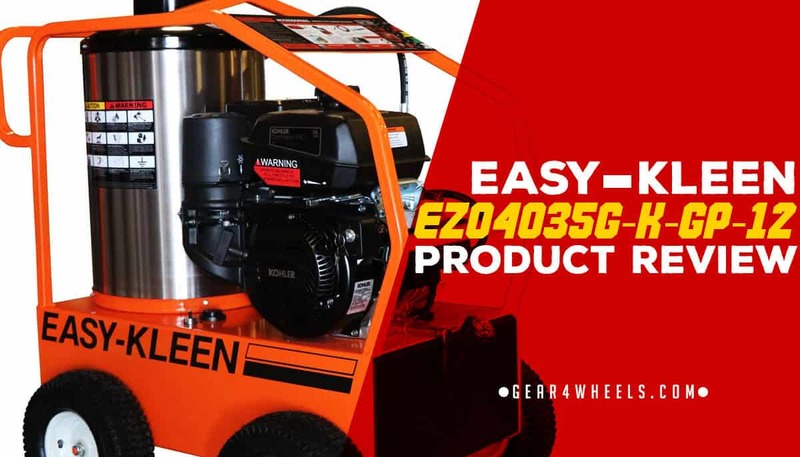 The Easy-Kleen EZO4035G-K-GP-12 may not have the easiest name to remember, but that doesn't stop it from being one of the best commercial pressure washers on the market. The Easy-Kleen brand encompasses a wide range of commercial models, with varying power levels and varying price tags. Some models within the range carry 13-horsepower engines, whereas others boast 15-horsepower, so this is somewhere in the middle. However, this is also amongst their most expensive models, and from the functionality offered over similar competitor models, it’s easy to see why this is the case. 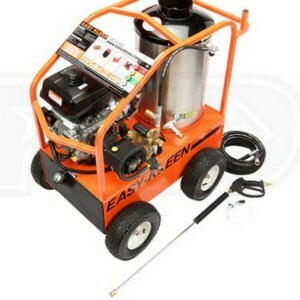 This model of Easy-Kleen pressure washer is the epitome of a commercial-use machine. Immediately off the bat, it's clear that this unit is built to take anything that a business environment can throw at it, with a robust, powder-coated steel frame fully encasing all the inner components. In terms of specific uses, this washer is best for people who would benefit from a hot water-capable pressure washer, owing to the large tank that’s included out of the box and mounted within the steel frame. Given the expense of this machine, which runs into the several thousands of dollars, it would be inappropriate for use at home. Purchasing such a robust machine for home use is not necessary and getting your money's worth would take years of continuous use. This is also not a simple model to use. Whereas many electric-powered pressure washers are simple to understand and use straight out of the box, this machine is less so. ​Understanding the most appropriate use for each different type of nozzle, as well as the complex temperature control, can take some time. There are components that are inherent to the functioning of a pressure washer and are therefore included by default; this includes the hosing, with 50-foot of hosing included, as well as the wand, chassis, nozzles – 5 in this case – and gasoline engine. This specific model also comes with a whopping 10-gallon fuel tank, capable of sustaining extremely prolonged periods of cleaning. Also included within the box are a thermo-pump protector, pneumatic wheels and heating coil for water temperature control. Some users of this machine choose to mount a hose reel onto the front of the chassis, as there is compatibility to do so. With such a long, 50-foot hose, this is an advisable step; it makes storing and transporting the machine far easier in large commercial environments. It is also worth considering additional nozzles and attachments, such as floor brushes. As mentioned, there is 10-gallon fuel tank for extended cleaning sessions. This is supplemented by an oil-burner that allows water to be heated for extra cleaning power, while a built-in heating coil and temperature controller allow precise adjustment of the cleaning temperature. Additionally, a pressure regulator brings additional safety to the machine. All the inner components are adequately protected by a rugged 12-gauge one-piece steel frame, fully powder-coated, which provides a durable roll cage for the engine and pump components. The whole pressure washer is structurally braced, offering protection against pipe wear and damage caused by vibration. Whether your business is small, medium or large, if only the best will do, then you’ll want to consider investing in the Easy-Kleen EZO4035G-K-GP-12. In addition to the efficiency of this machine’s CU rating, 50-feet of reinforced hosing and durable chassis, you’re also getting hot water control, which is a feature not often seen in all washers. It doesn’t come cheap, but in a business environment you’ll soon realize your money’s worth from this machine.